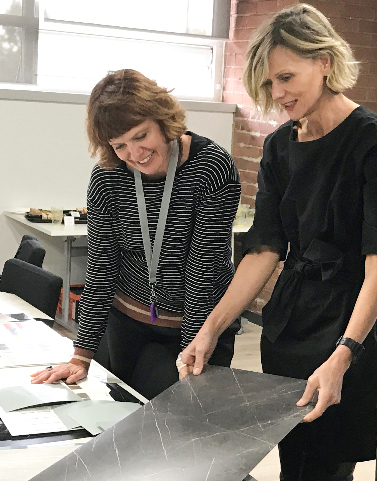 Multipanel has collaborated with Formica Group, the world's largest manufacturer of decorative surfaces and high pressure laminate, on its biggest ever new product launch, which includes the fabulous Linda Barker Collection. Multipanel, the UK’s leading brand of waterproof decorative panels for bathrooms and kitchens is to showcase its new 2018 collections at KBB exhibition in Birmingham on 4th-7th March. Activity over the last twelve months has been intense for Multipanel’s design and manufacturing teams, responsible for bringing to market 31 brand new designs. This True Scale technology has been adopted in the Linda Barker Collection for Multipanel. Here, panels have the authentic look and feel of Calacatta marble, fossilised timber and patinated corten steel. The alliance with Formica Group (based in North Shields, Tyne and Wear) is part of an overall strategy to source more materials from UK suppliers. Multipanel’s Managing Director, Sarah McLean said: “There is a clear business argument for sourcing materials from the UK including, reducing production lead times, reducing stock levels and a further reduction in our carbon footprint along with the ability to achieve better quality control and most importantly reducing delivery times for our customers.” The company further demonstrated its support to sourcing materials closer to home by becoming a member of Made in Britain, a not-for-profit organisation established to promote and support British manufacturing.